What is the doctrine of the Trinity all about, anyway? Why do Christians hold to it? Where does it come from? What does it teach? This article addresses these questions and more. To clarify the doctrine of the Trinity, we follow the Question and Answer Format. 1.. Where does this doctrine come from? First, at the baptism of Jesus, the Father, the Son, and the Holy Spirit were present. As soon as Jesus came up out of the water, “he saw the Spirit of God descending like a dove and lighting on him. And a voice from heaven said, ‘This is my Son, whom I love and with him I am well pleased.’” (Matt. 3:16-17). The Father’s voice sounded from above and affirmed the Sonship of Jesus, and the Holy Spirit descended on him and empowered him. Second, at the end of the same Gospel, Jesus is resurrected, and he commissions the disciples to go into all the world and preach the gospel. These two verses are part of the Great Commission, which Evangelicals take seriously. “All authority in heaven and on earth has been given to me. Therefore, go and make disciples of all nations, baptizing them in the name of the Father, the Son, and the Holy Spirit” … (Matt 28:18-19). This passage affirms that Jesus was granted all authority in heaven and on earth. This passage also demonstrates Jesus’ early declaration of the Trinity. Therefore, this doctrine comes from him, originally but indirectly. Third, Christians believe that the entire New Testament is inspired. The Apostle Paul also affirms the doctrine of the Trinity. In his second letter to the Corinthians, he bids farewell to them: “May the grace of the Lord Jesus, and the love of God, and the fellowship of the Holy Spirit be with you all” (2 Corinthians 13:14). Thus, Jesus and the Holy Spirit exist with the Father, and from their heavenly vantage point they are able to communicate grace, love, and fellowship to the believers (cf. Ephesians 4:4-6). Fourth, Peter the Apostle, the humble fisherman from Galilee, stood in Jesus’ presence when he spoke the Great Commission. Peter may not have fully understood Christ’s words then, but now he begins his epistle, under the inspiration of the Holy Spirit, restating the Trinitarian formula in his own words. He says that the people of God “have been chosen according to the foreknowledge of God the Father, through the sanctifying work of the Spirit, for obedience to Jesus Christ and sprinkling by his blood” (1 Peter 1:2). It is clear from this verse that each person of the Trinity has a function or role in the world. The Father chooses, the Spirit sanctifies, and Jesus redeems people with his blood that he shed on the cross. The readers should go here and look up these verses: John 1:1-4, 14:26, 15:26, 16:13-14; Acts 10:38 in connection with Romans 15:13; 1 Corinthians 12:4-6; Colossians 2:9; Hebrews 1:3, 1:8, 1:10; Titus 2:13; 2 Peter 1:1; Jude 20-21. Each passage affirms the function and person of the Father, the Son, and the Holy Spirit, and sometimes just the Father and the Son. 2. Doesn’t this doctrine really come from later Church fathers? This doctrine is developed by great theologians like Athanasius (c. AD 296-373) and Augustine (AD 354-430), but it was not invented by them. The New Testament was written to clarify pressing doctrinal and pastoral problems and issues that arose in the church. Here are four examples: what did Jesus teach or do about sickness or dietary laws or the Sabbath? What was his resurrection like (cf. the four Gospels)? How are people saved (or get into heaven) and are sanctified by the Holy Spirit (Epistle to the Romans)? Why should Christians not subject themselves to an old-new law (Epistle to the Galatians)? And how should Christians live in the church and withstand persecution (Peter’s Epistle)? Therefore, the New Testament authors, under the inspiration of the Holy Spirit, were not directed to develop the doctrine of the Trinity. Instead, they seemed to have assumed it, as we saw under Question One and the four passages. They affirmed the full deity of Christ and the full deity and personhood of the Holy Spirit. To repeat, Church fathers developed the doctrine of the Trinity from their reading of the New Testament, but they did not invent the doctrine out of thin air. For more information on the doctrine in the church fathers (post-apostolic church), see this page. 3. Is the word Trinity found in the Bible? It is not found in the Bible, probably for the reason stated in no. 2. The New Testament authors were engaged in other issues, and they assumed the reality of the Trinity, which is greater than a label. Those three statements mean that God exists in three persons who share the same essence or being. What this means is that God exists in the distinct and co-equal persons of the Father, the Son, and the Holy Spirit, but they share a fully divine essence or being, such as uncreatedness, eternality, simplicity (non-composite or indivisible), immutability (unchangeableness), omniscience (all wise and knowing), omnipotence (all powerful), goodness, mercy, holiness, will and freedom, and so on. However, to repeat, the three persons share the same essence. That is, the Father and Son and Holy Spirit duplicate the same attributes. The Father, the Son, and the Holy Spirit are equally wise and merciful and holy; one is not more wise or merciful or holy than the other. Augustine says: “These three have the same eternal nature, the same unchangeableness, the same majesty, the same power” (On Christian Teaching I.12). This article has a list of the divine attributes that all three persons of the Trinity share in perfect unity; click on any of the pages. 5. Do you have any illustrations? These four figures come from Wayne Grudem’s Systematic Theology (Zondervan 1994, 2000). Only the fourth figure (14.4) communicates the right idea. The others miss the mark. Warning! Those are only illustrations, not an exact theology. Many Muslims believe the Quran is uncreated. See the Uncreatedness of the Quran and the Unity of Allah. Muslims claim that the Quran says that the “spirit” or Ruh (Ruh al-Qudus = Holy Spirit) is actually Gabriel. But nowhere does the Quran say it is Gabriel. Muslim are simply inferring it, so that they don’t have to deal with an inconsistency in their theology compared to the Quran. See the Confusion Concerning the Identity of the Spirit and Gabriel in the Quran. Now let’s return to Christianity. 7. How are the three persons distinct? In the work of creation, the three persons of the Father, the Son, and the Holy Spirit had different functions. God the Father spoke the world into existence (Genesis 1-3), but God the Son carried out the divine decree. The Gospel of John says of Jesus: “All things were made through him [Jesus], and without him was not anything made that was made” (John 1:3). God the Holy Spirit was active in creation, “brooding over the face of the waters” (Genesis 1:2; see also Psalms 33:6 and 139:7). 8. If there are three persons, why are there not three Gods? The co-equal and distinct persons of the Father, the Son, and the Holy Spirit are not three Gods because they share the same essence in complete unity. This is difficult to grasp because we have no comparison that we can experience empirically (with our five senses). Augustine’s analogy is profound, because we have all experienced love from a lover, and we have returned the same love. But it still does not adequately explain how the one God shares this divine attribute of love and all the other divine attributes in three persons. Our human love is but a poor reflection of divine love. We cannot observe this with our eyes, so all analogies from nature and humanity ultimately fail in illustrating the Trinity. Analogies from nature cannot reach up to heaven so that we can connect them to the Trinity. Our finite and limited mind cannot grasp this mystery, even after our minds have studied the doctrine for years. The strict unity of God does not make sense in terms of the love of God, because divine love amounts to self-love. To clarify further why there are three persons, but not three Gods, God’s essence is not divided equally into three parts; it is not one-third, plus one-third, plus one-third. Also, the three persons are not added on to God’s essence or being, as if they are tacked on to the outside of God. Rather, all three persons share the same essence, fully God in one being, in total and perfect unity. Thus, basic Christian doctrine teaches that one God exists in three persons: the Father, the Son, and the Holy Spirit, not in three Gods, which is called tritheism. Christians reject this doctrine. 9. However, doesn’t 1 + 1 + 1 = 3? So isn’t belief in the Trinity irrational? All natural analogies ultimately fail, and so do mathematical ones. However, let’s use some nonetheless, to clarify the simplistic addition model. Let’s say that we add an infinite number of red books to an infinite number of white books, and still add an infinite number of blue books to the red and white books. Despite adding these three sets of infinite numbers of books together, we have not augmented or increased infinity by even one book. Such is the mystery of infinity; we cannot figure it out. 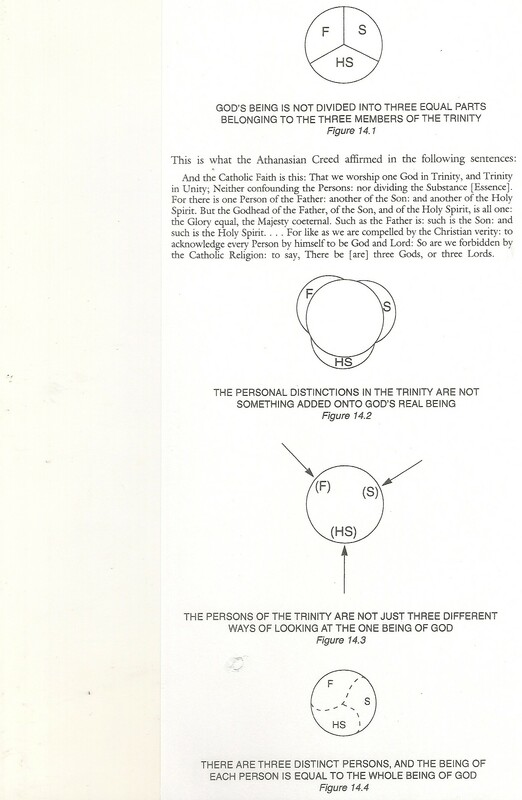 However, these three mathematical analogies of the Trinity ultimately fail because, among other reasons, the three infinite sets of books have different properties, because they do not exist in perfect unity in one essence, and because we do not “add up” or even “multiply” the three persons of the Trinity. Thus, infinity is a mystery, and so is the Trinity. Belief in the Trinity is not irrational, but trans-rational — above our puny minds to figure out, ultimately. Go here for a more thorough explanation and examples of the oddity of infinity in the world we know. 12. Doesn’t the expression “God the Father, God the Son, and God the Holy Spirit” mean three Gods? 11. Doesn’t the doctrine of the Trinity entail contradictions? The Trinity ultimately is a mystery, but it is revealed in scripture, so all Bible-educated and Bible-believing Christians believe in it, even though they may not understand it fully. This page explains more fully why it is not a contradiction to say that three persons share the same divine essence. 12. Still, though, would the true God exist in a complicated way like the Trinity? We Christians believe that God is knowable as far as he has revealed himself through Jesus Christ, the Scriptures, and the Holy Spirit who lives in us, and other avenues like the creation. However, we also believe that God in his pure essence is unknowable. No one has seen God in all of his splendor and glory. We humans down here on earth are limited by our five senses and our finite minds, which process the data taken in by our five senses and somehow reformulate them into ideas. For centuries philosophers have been debating each other over how the mind works. So how can the human mind figure out and calculate the pure nature of God? Given God’s infinite greatness and ultimate unknowability, and given the finiteness of our five senses and the limits of our minds, it stands to reason, therefore, that some ideas about God are perplexing and unsolvable. C. S. Lewis alludes to this in his book Mere Christianity, in the chapter “The Invasion” which discusses the Incarnation (God the Son becoming man). Here he does not accept the natural human wish that religion should be simple. It is no good asking for a simple religion. After all, real things are not simple. They look simple, but they are not. The table I am sitting at looks simple: but ask a scientist to tell you what it is really made of — all about atoms and how the light waves rebound from them and hit my eye and what they do to the optic nerve and what it does to my brain — and, of course, you find that what we call “seeing a table” lands in mysteries and complications which you can hardly get to the end of. Lewis uses the example of looking at a table, and if we let our vision go no further, then the table remains simple. But if we go down the path of knowledge any farther, then the table gets complicated really quickly. The same is true of our knowledge of God. If we keep our knowledge of him simple, then we are not bothered by the deeper doctrines. But once we probe more deeply, we discover that God is ultimately a mystery in his pure essence and glory. This article discusses what the mystery of God means to us humans, with many biblical references. 13. Doesn’t the doctrine of the Trinity ultimately come from pagan myths? The doctrine of the Trinity, if properly understood, is found nowhere in mythology – not even close. Zeus, Poseidon, and Apollo and any other trio of gods from around the world do not share all of the same attributes in perfect unity as one God. In fact, Greek myths go out of their way to keep these gods distinct as three gods and beings with their own special attributes. The Trinity has nothing to do with a family or pantheon of squabbling gods or separate divine beings. This is polytheism, and Christians reject it. 14. Is the doctrine of the Trinity really that important? For Christians, the doctrine is indispensable for many reasons, but we focus on two. The doctrine of the Trinity cannot be given up without irreparable damage to Christ’s atonement; and salvation or how we get into heaven becomes unclear, which is life’s ultimate question. 2:8 For it is by grace you have been saved, through faith – and this not from yourselves, it is the gift of God? 9 not by works, so that no one can boast. 10 For we are God’s workmanship, created in Christ Jesus to do good works, which God prepared in advance for us to do. Without the full deity of Jesus Christ, God the Son, our salvation or guarantee to get into heaven becomes shaky. Therefore, the doctrine of the Trinity is a matter of eternal life and death. We Christians must hold on to the Trinity, as we experience the Father, the Son, and the Holy Spirit in our daily life and in our creeds. Updated 8/26/16, with small structural corrections. Updated 10/16/17, with major changes. This entry was posted in Bible and Theology, World Religions and tagged Doctrine of the Trinity, Does Islam have a trinity?, Trinity, What does Trinity mean?, What is the Trinity?, Why is the trinity important? by james malcolm. Bookmark the permalink.